I was never not going to go to University. My father was on the lecturing staff in Botany; my mother was a graduate in science from the University of Western Australia; my sister Margaret, three years ahead of me, was about to graduate in Arts. I began my studies in 1947, enrolling in Science. Maths, Chemistry and Physics were all compulsory at the time, with a choice of Biology or Geology. In second year I took Botany, Chemistry and Physiology; these were all subjects with prac classes and I was left with one free hour per week. In third year I did Botany and Chemistry. We thought Arts students had it easy! There were famous names (in University terms) lecturing to us. Mr Swoose O’Connor was well known in Chemistry labs for frequently saying ‘turn those blazing bunsens down’; Professor Parnell in Physics was visited by a dog each year, a subtle cue that he should retire; Professor Goddard gave first-year biology lectures in Albert Hall in Ann St, and would appear on stage in the middle of an English country cottage scene or another pleasing background without turning a hair. With pocket money of five shillings (50c) per week, my sister and I felt well off, but we still needed to manage carefully. We walked from Central Station down to the University to save the bus fare down George St. Our spending was at the Refectory housed in the old Army buildings on the Domain, manned by Mr Malley. We called him Joe. Meat pies were 3d each, a cup of tea or coffee 2d. Occasionally we used this as a mid-afternoon break from Chem prac. Commem Practice was held each Saturday night in the early part of the year. It was a gathering held in a lecture room at George St to ‘practice’ (enjoy) singing a number of songs which were mainly parodies sung to well-known music. For example, ‘I’m a helluva helluva helluva helluva engineer’ and ‘The Profs are sitting in a row’. The rest of the evening was spent dancing and, in some cases, meeting up with possible partners for the Commem Ball held later in the year. Graduation for the sciences back then was known as Commem Day. The Commem procession produced a series of displays on the backs of trucks. These were examined—and mostly approved—by a couple of police officers, and were then driven through several of the city streets to entertain the public. One of our science student’s trucks carried a huge bathtub, complete with showerhead and a number of suitably dressed students with the sign ‘Behind the Iron Curtain we share everything’. Another participant was a student carrying a chamber pot half-filled with dried peas which he graciously offered to the crowds, ‘have a pea’. This was very popular. The Commem ceremony was held in the City Hall and was, on the whole, a dignified occasion. The Hall was filled with pleased relatives of the graduands, while the stage held staff members, chancellor, and of course the graduands. Appropriate songs were sung for the faculties present, and sometimes the dignity was spoiled by overactive students enjoying themselves. Our ceremony went well, until mercuric fulminate was scattered on the mat of the central aisle, producing a mild explosion when trodden on as the academic procession walked down the aisle. Yes, I was never not going to go to University. My parents and sister had continued their studies before me, it was what was expected. It wasn’t anything special to me, many women were now attending university. Though I must admit, the mercuric fulminate, I may have been responsible for that. A nickname for him at the time, ‘Swoose’ is a cross between a swan and a goose, which he is said to have resembled. This was a time when Australia still used the pound. 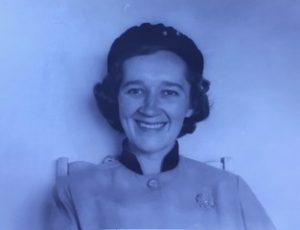 Joan Cribb, Master of Science 1953, Brisbane. This entry was posted in Family and tagged 1940s, Brisbane City, Commem, Heritage, Mercuric Fulminate, Science. Bookmark the permalink.